What Sunglasses Did Jackie O. Wear? Fashion icon and former first lady Jacqueline Kennedy Onassis was a lover of sunglasses. She kept several in a large bowl near her front door and grabbed a pair before she walked out. Oversize sunglasses became her signature look and started a fashion trend dubbed the "Jackie O" style. The sunglasses sported by Jackie O. were created by several world-famous designers. The original Nina Ricci 3203 sunglasses were worn by Jackie O. in 1978 at a Robert F. Kennedy Pro Celebrity Tennis Tournament. The sunglasses were oversize square-shaped with a brown-and-tan plastic frame, designed and manufactured in France by the L'Amy Company for designer Nina Ricci. A copy of the original Nina Ricci sunglasses debuted in 2010, called the Jackie "O" line, which offered six colors. French eyeglass designer Francois Pinton made several sunglasses for Aristotle and Jacqueline Onassis in the late 1960s. One of the most popular frames created for Jackie O. was called the Spa 2. The design was a large, black plastic frame with a somewhat oval shape. It had a black gradient lens. The Jackie 1 sunglasses were created by Francois Pinton over 50 years ago, specifically for Jackie O. The frame is a large, round tortoise shell with a brown lens. These sunglasses are sold today with other classic styles from the original Francois Pinton collection for Jackie O. called the Jackie 2 and Jackie 3 sunglasses. 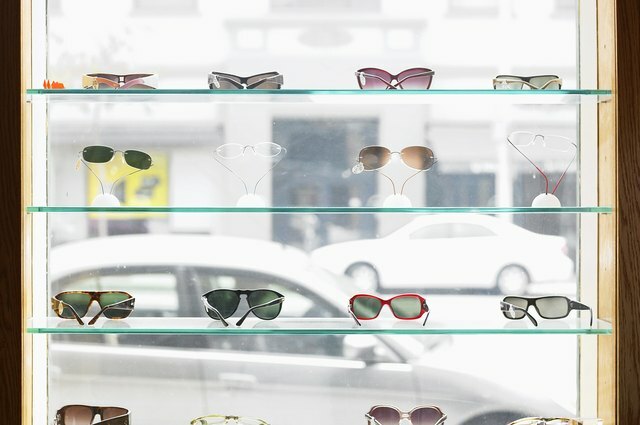 French eyeglass designer Pierre Marly sold several pairs of the Traction P711 sunglasses to Jacqueline Onassis at his Paris optical shop in 1967. Jackie O. purchased one in black and two in tortoise tones on her initial visit. The Traction Company, which has created sunglasses and eyewear since 1927, still sells the popular P711-style sunglasses. The sunglasses are oversized plastic rounds with a black frame and dark black lens. Lucky Mag:The Five Essential Sunglass Styles Every Woman Should Own: The Jackie O-Style "Lady Shades"